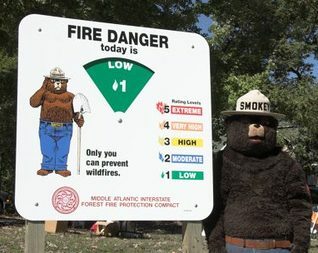 These high quality FRP/ABS signs are printed in full color with National Fire Danger Ratings. Fully assembled and with mounting hardware to attach easily to standing wood posts or to a building. Rating wheel is fully enclosed and has a locking mechanism. Add your agency name and/or logo at the bottom for an additional $25 per sign. Made in the USA. SHIPPING COST of $100 per sign is included. Allow 2 - 4 weeks for delivery. QUANTITY DISCOUNTS: 2 for $798.00 each, 3 or more for $775.00 each.